"Brown Bear, Brown Bear, what do you see?" Thus begins a charming, eponymous children's literature classic by author Bill Martin. Via illustrator Eric Carle's pictures, preschoolers learn about colors, animals. patterns, math and also friendship. Here are free printable games, coloring pages, crafts, worksheets and learning activities from the children's literature classic, along with the companion Martin/Carle book "Polar Bear, Polar Bear, What Do You Hear?" Use these activities to celebrate Children's Book Week 2015--May 4-10. DLTK-Teach has free printable activities from Brown Bear Brown Bear What Do You See? There are pictures of book characters: brown bear, red bird, yellow duck, blue horse, green frog, purple cat, white dog, black sheep, goldfish, mother (teacher), and children (students). Print in color and use for worksheets, reading booklets and lessons. Or, extend learning activities by printing in black and white and using as coloring pages. Have kids cut out animals to practice eye-hand coordination. Children learn color, pattern, rhyme, fine motor skills, spelling and writing in multisensory ways. Teachers and homeschoolers, use animals templates as felt board patterns. Trace image on appropriate felt color. Add each animal to board as you read the story. There are printable activities for Brown Bear in Spanish, too. DLTK-Teach also has free printables from "Polar Bear, Polar Bear, What do You Hear?" Polar Bear, Polar Bear was written 25 years after Martin and Carle's Brown Bear came out in 1967. I remember how tickled our eldest was to find that her beloved Brown Bear had a friend. Images from this story include zoo animals: polar bear, lion, hippopotamus, flamingo, zebra, boa constrictor, elephant, leopard, peacock, walrus, zookeeper and children. 1+1+1=1 is a homeschool blog with mom-created a free printable Brown Bear, Brown Bear activitiespacket which includes reading and math games: matching, graphing, spelling, writing, 3-part cards, 1-10 counting puzzle, tracing and color by word. This blog has other free printable kindergarten learning games and preschool activity packages. Themes include: ballerinas, princess, rainbow, ocean, pond life, love, Christmas, winter, spring, bugs, cats, baby animals, birds, construction trucks and machines, monsters, farm and more. There are printable reading packs on children's literature favorites: Mickey Mouse, Handy Manny, The Very Hungry Caterpillar, Noah's Ark, Veggie Tales, Word World, Nemo, Hermie, Tarzan, Word World, Doc McStuffins, Dora the Explorer, Octonauts, Little Einsteins, Chicka-Chicka Boom Boom, Five Little Monkeys, Dinosaur Train and Thomas the Train. We homeschooled our four children from 1992-2005. Home education was pretty new and computer resources nil. 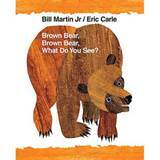 Our kids now 28,26, 24 and 18, loved the Martin-Carle books in preschool. Our twin grandsons love these books thanks to their mama (she who loved Brown Bear so as a tot). The boys already have Brown Bear, Brown Bear and Polar Bear, Polar Bear on their bookshelves! It's good to pass these classics on to another generation!